I am the most fortunate womon traveler in the u.s.ofa! Today, I drive my truck to my grandson's soccer game. I am late so I pull into the cul-de-sac almost next to the field and begin to back into a tiny space on a curved curb. Yes, I'm showing off my amazing parking skills! As I put my truck in gear and reverse into the space, suddenly clanging noise begins so loud all the kids freeze momentarily mid-field and just as suddenly, the truck won't move. I had been feeling a weird vibrating in third gear & intended to ask my mechanic about it when I got my oil change Monday. But here I am, stuck on a Saturday, only half-way into the parking space with only soccer parents and coaches in attendence. I crawl under the truck and immediately locate the problem, a feat I am very proud of. 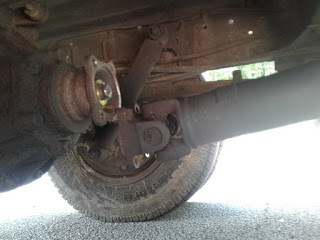 I see that the drive shaft that is supposed to be connected by four bolts to the rear axle, is dangling from one bolt. 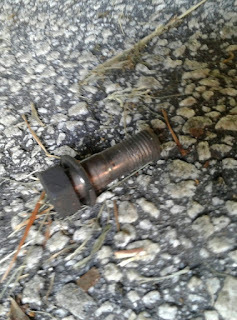 Surveying the ground, I notice one of the bolts lying there, stripped and without the nut or lock washer. I am very relieved as I think I do not need to be towed but merely need to get new bolts and reattach the drive shaft. Suspicion wells inside of me.Even before I go to the Isuzu dealer who asks me twice if it's really 4 bolts I need as he's rarely if ever heard of all the bolts dropping out together. Is it coincidence? Or sabotage? Or maybe loosened by the bigoted racist white men in Texas who climbed under my truck to replace the axel grease lug nut? Or by the Iowa Speed Co white boys who hated my messages and refused to change my oil claiming the heads of the lug nut were stripped as they walked back and forth underneath in the deep ditch my truck was straddled over for a good twenty minutes. Or maybe a random hater with a wrench decided he needed more nuts so he helped himself to mine. Or it just happened. 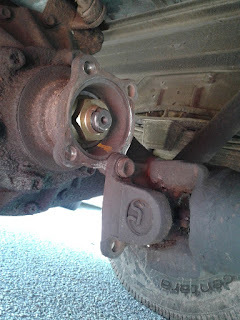 I'm not in the habit of checking the bolts under the truck - but I will get into the habit. Do I believe it arbitrarily happened or do I blame someone, one of the haters that I know are capable of great violence. I find a lovely road mechanic who loves my messages and only charges me $50 to come out to me on a Saturday afternoon, wrench the drive shaft into place, put in the bolts, and send me on my way.